I am always in the search for the perfect day planner. For the last two years I have actually made my own using blank Moleskine books but I wasn’t too impressed with the one I made for 2012. I didn’t plan accurately for a monthly view and felt my space for appointments on the weekly view was mediocre. 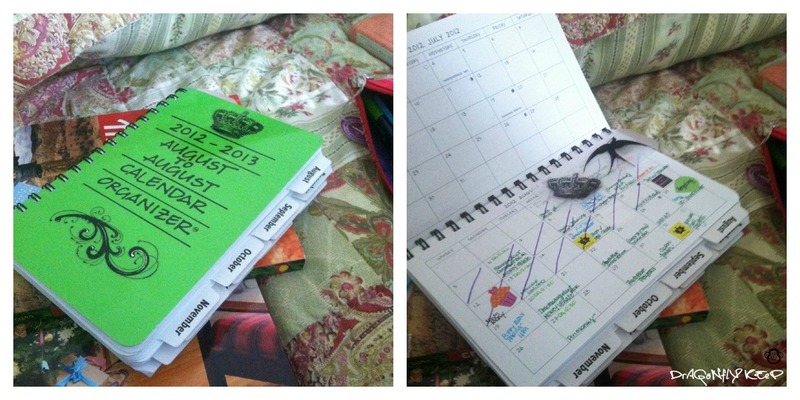 Plus, I had yet another planner for blog content…too many places to have to check for one little person. One a trip to the thrift store I came across a planner that I think is going to work perfectly for me. It is from Mixed Role Productions ,a Made in the USA company, that uses 100% post-consumer recycled paper for the calendar pages. The book was used but I picked it anyway since it had an order form still inside. I tried it out for the remaining months it had and found it was taking care of all my needs. There is plenty of space in the weekly sections to write out appointments and copious notes. The monthly section allows for my blog content planning and reminders of MeetUp events and doctors appointments. The planners come in six different colors; Fuchsia, Licorice, Green Apple, Lapis, Turquoise, and Violet. I went with Green Apple. I use the Avery NoteTabs with Months for the monthly layout page for quick reference and use the Martha Stewart Home Office™ with Avery™ Removable Color-Coding Labels for reminders. I am careful to use pens that don’t bled through so I can read my notes on the next page. I recommend an art pen, preferably American made if you can find it. Plus, I tend to bling it out with some sticker embellishments with give it a more customized look. I still use my smart phone for appointments but each Sunday, I review that and write in any new appointments. There is a saying “If I don’t write it down, I won’t remember to do it” and for the most part, that works. That looks fabu! After looking at their site, they’re like a double win for USA – they are made in the US and are sold in smaller independant shops! That’s an awesome find! I agree. Its one of my happy discoveries!